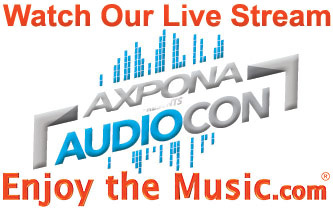 (March 31, 2015) From April 24th – 26th, Enjoy the Music.com and sister site Enjoy the Music.TV will once again be live streaming the AXPONA (Audio Expo North America) Audio Con event at The Westin O'Hare in Chicago. AXPONA 2015 will have more floors full of listening rooms, an Ear Gear Expo (EGX), plus a doubling in size of their Marketplace section as compared to their 2014 event. Attendees can greatly benefit from direct contact with designers and manufacturer-trained personnel of high fidelity audio equipment and music engineers while also listening to the latest equipment available within the industry. Furthermore, a variety of educational seminars will be conducted by leading authorities within the high-end audio field. Active displays provide attendees the ability to hear their own music through the world's very best audio systems! On Friday, April 24th, Patricia Barber will be performing live; with John Primer taking the stage on Saturday, April 25th. "AXPONA is very excited to once again have Steven R. Rochlin host Enjoy the Music.TV / Enjoy the Music.com's live streaming coverage as part of this exciting event. Many years ago I had the distinct privilege of meeting, and spending time with, Steven in Italy and have been a fan and friend ever since. The quality of content produced by Enjoy the Music.com is mind bending to say the least and is always a big hit with exhibitors and attendees. This year's show is going to be seen as a completely new and advanced means to enjoy an event for the audio and music industry. Great lengths have been taken to produce a totally immersive event that will add greatly to the attendees' knowledge and enjoyment of recorded and live music. As always, Enjoy the Music.com / Enjoy the Music.TV will be a big part of this reach into the future and progression of AXPONA / Audio Con." "Our first live streaming event was at AXPONA 2014 and it brings me joy to once again host the live broadcast of their outstanding 2015 event for audiophiles and music lovers," said Steven R. Rochlin, Editor and Creative Director of Enjoy the Music.com. "For many years I have attended AXPONA and have always been impressed by both the organization and exhibitors. While there is no substitute for the experience of attending AXPONA, with the ability to try out some of the industry's best gear plus live concerts by well-known artists, for those who can't be there in person can greatly benefit from our live stream. By integrating live chat and a dedicated Twitter feed, those watching our broadcast worldwide can ask questions in real time to those we are featuring within our live video stream. As host of the broadcast, I am truly humbled to once again be invited back as part of AXPONA's spectacular show." Enjoy the Music.com is now scheduling appointments to appear within our live broadcast during AXPONA 2015. Time slots are already filling up fast! Exhibitors need to e-mail us by clicking here. We look forward to seeing everyone in Chicago and streaming live from our mobile TV studio at AXPONA 2015 from April 24th through 26th at the Westin O'Hare. Audio Expo North America (AXPONA) presents Audio Con as North America's premier event for audiophiles and music lovers. Now in its seventh year, AXPONA showcases the latest innovations in music playback technology. Celebrating its third straight year in Chicago, the event returns to the city known for its vibrant music scene from April 24 – April 26, 2015. At AXPONA, attendees experience hundreds of high-end audio exhibits, demonstrations, seminars, networking and live musical entertainment. AXPONA is dedicated to serving the tastes of all music lovers, growing the overall audio industry and expand its reach into a new and younger audience. In 2015, AXPONA introduced the name Audio Con, short for Audio Convention, a new fresh name to better describe the total event experience. AXPONA is produced by JD Events LLC. For more information visit www.AXPONA.com. Enjoy the Music.com is the Internet's leading information site for high fidelity audio news, equipment reviews, digital music downloads, and show reports for home and mobile devices since 1995. We have received critical acclaim from worldwide Web surfers, like-minded audio publications, and notables such as the President of the Consumer Electronics Association. With the longstanding partnership of eight print publications, plus an additional seven from Enjoy the Music.TV's online network, Enjoy the Music.com is the strongest grouping of press within the history of the high-end audio community. Enjoy the Music.com also offers its own Review Magazine, daily industry news and over 185 show reports online. Enjoy the Music.com is media sponsors for many consumer electronics events including AXPONA, The California Audio Show, TAVES, T.H.E. Show Newport and the Rocky Mountain Audio Fest.